Story Time With the Library Lady: Flannel/Foam Friday: "Fall Is Not Easy", But It Sure Is FUN! Flannel/Foam Friday: "Fall Is Not Easy", But It Sure Is FUN! It was not the spring and summer I wanted--my family woes kept me from doing a lot of programming, never mind blogging about it. But fall is beginning, things are (knock wood) on a more even keel in my home world, and I'm back to programs. Fall has lots of built in themes. Leaves, apples, pumpkins. Hibernation. Halloween and Thanksgiving. And after more than 20 years of programs I've got lots of great stuff to use, from classic books to stories and songs with props and puppets. I will use a lot of that stuff. A story like "What Will It Rain? ", a song like "Five Red Apples" or a wonderful book like Nancy Tafuri's "The Busy Little Squirrel" need to be shared every year. There are always lots of new kids and the veterans never complain about repeats! But as easy as it would be to just coast along and do the old faves, that wouldn't be a good thing for me. I need to challenge myself to keep coming up with new ideas, new material. I was leafing (so to speak) through the Flannel Fridays and the Flannel Friday boards on Pinterest and "Fall Is Not Easy" leaped out at me. Why didn't I know this one? Simple. None of the branches in my system owned it--not even me. So I got it from a neighboring jurisdiction and fell in love with it. Now I will repeat something I've said here before, but with all due respect to the masterworks of flannel art that I see on the blogs, I often don't see the NEED to "flannelize" a lot of books. 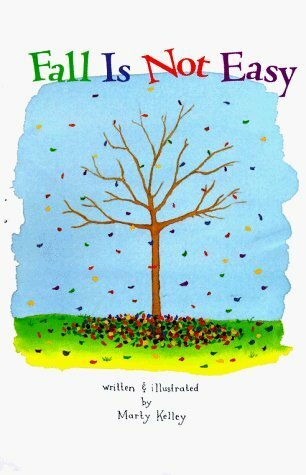 But once in a while I find a book that will really be even better in a special format, and I could see how the kids would love watching me change the tree's leaves on the board. So it was upstairs to my craft supplies to figure out how to do it. I prefer foam to felt and I have tons of foam shapes we've used at craft times. Plus I have fabric paints and lots of tubes of glitter glue. A little time in Michaels' scrapbook aisle produced leaves--and I got a great deal on them thanks to their phone app with its onscreen coupons! So this was easy to make, and a ton of fun. My thanks to Storytiming, Lucy, and others whose versions inspired this. And special thanks to the immortal Melissa Depper from whom I got the basic tree pattern and better still, a window into all that's going on in the story timing world! The slideshow explains how I made some of the pieces.